1912: Launched by J. Duthie Torry Shipbuilding Co, Aberdeen (Yd.No.371) for John Utting, Kessingland as LANNER. 5.1912: Completed (John Utting, managing owner). 28.5.1912: Registered at Lowestoft (LT1176). 9.1914: Requisitioned for war service as a patrol vessel (1-6pdr HA) (Ad.No.208). Based Liverpool with “A” division A/S Net Drifters. By 12.3.1919: Returned to owner at Lowestoft (J. Utting c/o Hobson & Co, Lowestoft). 26.11.1919: Sold to Ploughboy Co Ltd, Lowestoft (Samuel Turrell, manager). 24.10.1932: At Lowestoft in Outer Harbour, damaged in collision with steam drifter NIL DESPARANDUM (LT175) which sustained a broken stern. 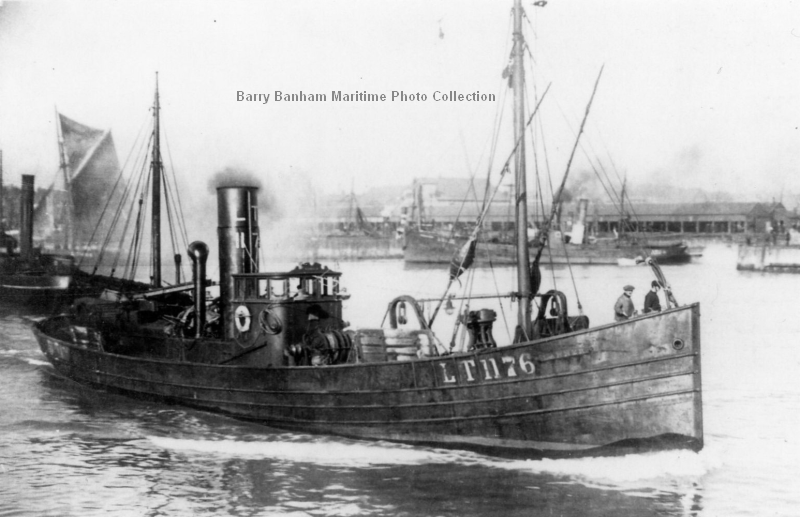 16.4.1936: Off Pembrokeshire coast in collision with Fleetwood steam trawler ALCAZAR (LT87). 31.5.1937: Sold to Leonard Thomas John Leftley, Lowestoft. 3.6.1937: Sold to Kittiwake Ltd, Lowestoft (John Victor Breach, manager). 11.1938: In North Sea picked up disabled motor drifter EFFICIENT (FR242) but fouled propeller when towline parted. Steam drifter MARGARET HIDE (LT746) connected and delivered Lowestoft. 20.7.1939: Off Peterhead in collision with steam trawler OCEAN DRIFT (LH73) sustaining damage. 13.11.1939: Requisitioned for war service on examination service (Hire rate £27.0.0d/month). 1940: To Mediterranean as a minesweeping drifter (Hire rate £27.13.6d/month). 1.1941: Based Suda Bay (Sk. William Stewart RNR). 7.1941: Based Suez Canal area with M/S Group 400 (Sk. G. C. Clarkson RNR). 6.1946: Sold to ? ?, ??. 25/10/2010: Page published. 4 updates since then. 13/10/2019: Removed FMHT watermark from image. This entry was posted in Drifter/Trawler, Seasonal Visitors, Steam Trawlers, Steamers (Picture) and tagged Drifter/Trawler, No Fleetwood owners, Seasonal Visitors on October 25, 2010 by Fred Smith.